The June 7 Advocacy Forum has been canceled and we are planning to reschedule in the fall (October/November). The main reason for the delay is that the planning committee is still working on making more progress in connecting with the next level of influencers so that we can bring concrete “action steps” and useful panel members to the next Forum. In late April, members of the Planning Committee (folks who signed up at the Feb. Advocacy Forum including Linder Alden, Helene Zimmerman, Carolyn Shepard, Leanna Harper, and Cindy Robbins-Roth) met with Bill Lowell (San Mateo County “Home for All”) to start identifying “action steps” to investigate and present at the next Forum. There was general agreement that the focus remains on identifying and building collaborations with existing groups that can support creation - especially in the near-term - of significantly more affordable supported housing. A big thank you to Bill Lowell for volunteering his time to meet with us – his experience with the county’s Housing Authority is very helpful. Here are the initial action steps that we propose – this group may not be able to pursue them all before the next Forum, but we certainly can bring them all to the Forum to recruit more folks for on-going follow-up. 1. CSH: Formerly the Corporation for Supportive Housing, this nationwide organization is a leading nationwide group. Bill and Linder report the CSH website http://www.csh.org/ is full of interesting housing projects, and they provide technical support and funding ideas. Let's reach out to CSH and see if they will come collaborate in our county. 2. Track down more info on what's happening with the apartment building at 531 Woodside Road that was gutted by fire in 2013 - so far, still no movement seen to rebuild. Helene and Carolyn are going to try to track down the building owner/landlord. Can we find a county partner to rebuild and reopen these 72 units? UPDATE: 531 Woodside Road 72- unit apartment building: Helene was able to obtain the name of the management company: VPM Management, 408 251-7540 (Dawn Pisciotta) and the building owner appears to be KDF Communities. Latest info is that the owner put this building on the market earlier this year because of the lack of a successful rehabilitation plan. http://www.kdfcommunities.com/ reports that KDF Communities LLC, a California limited liability company, is an affordable housing development company based in Newport Beach, CA that was founded in 1996. Since that time, KDF has emerged as one of the largest developers and owners of affordable family and senior housing developments in California. KDF has been involved in the construction, acquisition and rehabilitation of more than 5,300 affordable rental units in 44 properties throughout California. KDF’s success is evident through its long-term city and financial relationships that support the team’s commitment to quality and integrity. KDF’s ground-up new construction expertise and renovation turnaround stories that comprise the company’s portfolio exemplify a true focus on quality and building community. 3. Ask Dan Peck (Third Sector Capital) to introduce us to the groups collaborating in Santa Clara County (including Telecare, Abode Services, and the county) to kickstart a large-scale affordable supported housing push in that county. UPDATE: Dan made the introduction to Ky Le, the Director of Supportive Housing for Santa Clara County and Vivian Wan, the COO of Abode Services. Both of these folks collaborated closely with Dan’s company to develop Project Welcome Home in Santa Clara County. Vivian shared that Abode is already working in San Mateo County, mostly with Rapid Rehousing and landlord engagement. They have an office in Redwood City. Helene is organizing a conference call with Vivian to start the conversation about how Abode could be part of a plan to support affordable supported housing in our county. 4. Bring together Ken Cole and his team (County Housing Authority), Melissa Platte from MHA-San Mateo, and Chip Higgins of Caminar to talk about potential ways to use county funds NOT linked to federal grants to create more supported housing using innovative models including the multi-family housing co-op. Bring into the discussion partnering with support service agencies like Edgewood and Caminar to provide the mental health support expertise for the properties. UPDATE: Cindy sent out an email to the relevant folks to schedule an initial conversation. So far, this meeting has not been scheduled. Cindy will reach out again to the group. 5. A long-term plan: Bill noted that the county has around $22 million in local funds each year, some of those funds are for "preservation" - acquiring and refurbishing old buildings. Part of the challenge is that the cost of buying buildings to refurbish in our county has skyrocketed - it would take $10 million or so to buy a 20-unit building. There are no state or federal funds available for refurbishing - instead, they support building new structures, but then you run into the HUD long-term homeless requirement, which is a real hardship for folks already struggling with big challenges. Bill talked about putting together a plan that would get triggered when the next serious recession hits and drives down the cost to acquire properties. He noted that MHA's new Waverley Apartments (just opened!) were built on the site of an old warehouse. The state's "No Place Like Home" program is supposed to be funded with $2 billion. Keep an eye out for "Request for Proposals" to participate. Maybe ask State Senator Jerry Hill and State Assemblyman Kevin Mullin to come talk with the Forum about how we can access those funds. The Regional Centers (tasked with providing support and services for folks who meet specific criteria for developmental disabilities) have the ability to access a wider range of housing options for their clients than the mental health system has. Is there a way to level the playing field? To collaborate with Golden Gate Regional Center? The plan is to have folks from the planning committee follow up on as many of these key ideas as possible before the autumn Forum, and to present what we learned and get community input for further follow up at the forum. Please contact any of us with your questions and ideas. Do you, a loved one, or someone in your life deal with serious mental health challenges? Do you want to help advocate for improved services? Please join Caminar, in partnership with NAMI San Mateo County and Edgewood Center for Children and Families, for our quarterly community advocacy forum. The overall forum is focused on the big topic of how we support the improvement of services and supports for our loved ones living with life-long mental health challenges--especially truly supported housing and a wide range of services for folks. Our upcoming forum will specifically focus on getting creative about supportive housing business models and funding. On Tuesday, December 12, our Solano Region launched Resource Connect Solano at the Suisun City Council Chambers. Resource Connect Solano is a Coordinated Entry program that streamlines access to life-changing housing and supportive resources for people in Solano County who are experiencing or at-risk of homelessness. About 75 community members joined us to learn about the Coordinated Entry referral process and network with housing providers throughout Solano County. We were delighted at the impressive attendance and strong interest in this new program. Special thanks to Tranine Chisom and the entire Resource Connect team who did a fabulous job rolling this out the community. We look forward to serving individuals in the Solano Region with this transformative service that will support and empower vulnerable members of the community. For more information, please visit the Resource Connect Solano webpage or email us at rcs@caminar.org. Three years ago, April was spending the nights on the streets or in local parks in the bushes. April found the strength and courage to not only realize she needed help, but to ask for help from the Butte County Department of Behavioral Health. April was referred to Caminar and became a tenant of Avenida Apartments and an employee of Caminar’s vocational training program, Sensible Cyclery. When April started at Sensible Cyclery, it was difficult for her to make eye contact with her colleagues and her supervisor when speaking with them. After a few months, there was a dramatic change; April started to build the confidence she needed in order to achieve the goals she set for herself. 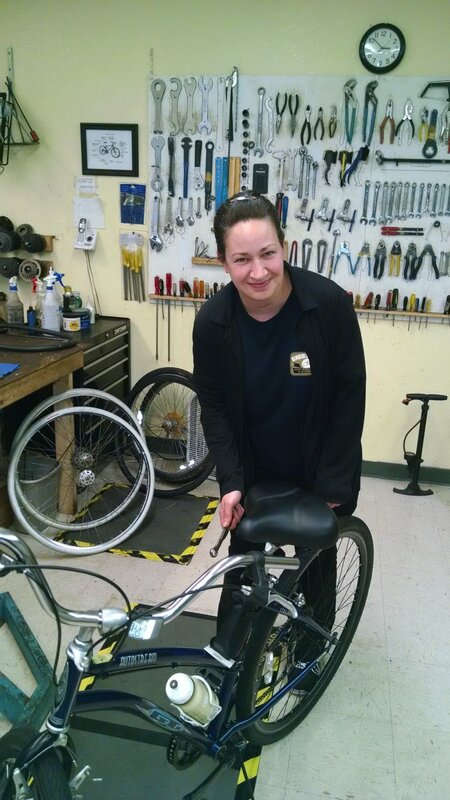 After completing and graduating from Sensible Cyclery, April enrolled in Butte College to take courses to become a computer programmer. April is now finishing her last semester and has been handpicked for an internship at a local computer programming company. April is moving to a regular, non-assisted apartment in the community as of December 1, 2017. April did not have to leave Avenidas, and when asked why she was, she simply said that she wants someone else to benefit from the help and opportunity that she had from Caminar’s services. Sincere thanks to April and Scott Walker, Program Manager for Sensible Cyclery, Pro-Touch and Avenida Apartments, Caminar Butte County Region, for sharing this inspiring story of resilience. Caminar is honored to receive a grant from the SAMCAR (San Mateo County Association of REALTORS®) Foundation, which strives to financially assist local nonprofit organizations that improve the quality of life for residents in San Mateo County. The SAMCAR Foundation has been a generous, ongoing supporter of our supported housing services since 2011. With the contribution from the SAMCAR Foundation, Caminar will continue to help people in the San Mateo community with severe mental illness (SMI) obtain and maintain suitable housing. SAMCAR Foundation’s grant will support our supported housing services in San Mateo by helping defray costs associated with housing and emergency housing support. With supported housing, our clients are able to maintain a healthy living situation within the community and begin the journey towards recovery. We are grateful for the SAMCAR Foundation’s contribution; grants from community partners like the SAMCAR Foundation help us further to our mission to improve the quality of life for people with mental illness by providing opportunities to live in the community with dignity and independence. For some, the jewel of the garden is its juicy tomatoes. For others, it’s the crisp kale and red-leaf lettuce. The community garden at Avenida Apartments on The Esplanade is a peaceful place where residents can learn about fresh, healthy foods and how to grow them. The facility, operated through a partnership with Butte County Behavioral Health and Caminar, provides housing for those with mental illness and physical or developmental disabilities. Employment opportunities and work training are offered through Sensible Cyclery, an on-site used bike shop, and Pro-Touch, a grounds maintenance and janitorial service.